Transportation in Barcelona is divided by zones, zone 1 (zone one) is for Barcelona city. Zones 2 through 6 are for cities outside Barcelona, ​​as Manresa, Mataró, Terrace, etc. Firstly, you’ll find in this page the prices for transport tickets used by most citizens of Barcelona, next the ones used by tourists and finally the recommended use of bank notes in special situations. All tickets (except single ticket) allow transfers between different means of transportation, such as boarding a metro, then a bus, a tram, etc., for 1 hour and 15 minutes for zone 1 tickets. This time is longer for other zones. (see below for more info). Two things to keep in mind when you buy the ticket: how many trips you plan to take and what the price is. It's important understand a average price per trip, depending on the ticket, if you want save a lot of money. ;) You can use our ticket calculator for know the best choice for you. Allows only 1 trip (is One-way ticket). 2.20€ for trip. Usually used by unsuspecting tourists because is the most expensive per trip! This ticket and the T-10 card don't allow travel to/ from El Prat airport. With the other tickets or cards there is no problem. Only for zone 1 and not allow transfers between different means of transportation. This ticket and the T-10 card don't allow travel to or from El Prat airport. Single ticket from the airport. 4,50 Euros Allows you to make only 1 trip, from the airport to Barcelona (or vice versa), and does not allow you to go with other public transport, or make transfers. We have tried it buying the ticket at El Prat Airport and from there we went with the train to the Passeig de Gràcia stop and when leaving the train station, we were NOT allowed to enter the Passeig de Gràcia subway. Card which allows for 10 trips. Multipersonal (For one person or some. For example if you are with your partner, with this card you can make 5 trips and you partner 5 trips, using the same card). This card and "single ticket" don't allow travel to/from El Prat airport. With the other tickets or cards there is no problem. The price per trip is 1.02€. This card is the one most used by people living in Barcelona.Used by 70% of the citizens of Barcelona. This card and the "simple ticket" don't allow travel to or from El Prat airport. T50/30 Card. 43,50 Euros Allows for 50 trips in 30 days. Unipersonal (for one person only, if you're with a friend, everyone should buy a different card). 0.87€ per trip (if you really take 50 trips in 30 days or less). Tarjeta T70/30. 60,90 Euros Allows for 70 trips in 30 days. Multipersonal (for one person or for families or groups). 0.87€ for trip (if you really take 70 trips in 30 days or less). Unlimited travel for 30 days. For one person only. ID is required. Only for zone 1. If you take 1 trip every day for 30 days, the price € 1.88 per trip! 1 trip/day = 1,80 € /trip. 2 trips/day = 0,90€ /trip. 4 trips/day = 0,45 € /trip. This card is good only if you take 2 or more trips per day, every day (including weekends and holidays) for 30 days, Otherwise you'll pay more than any other card! Tarjeta T-Trimestre. 145,30 Euros Unlimited travel for 90 days. Unipersona (for one person only). ID is required. Is like paying 48.43€ for month (T-mes is 54.00€). If you take 2 trips every day (including weekends and holidays) for 90 days, the price per trip is 0.81€. If you take 4 trips every day, the price per trip is 0.40€. Tarjeta T-Jove. 105,00 Euros Youth Card. Unlimited travel for 90 days (under 25 years old). For one person only. ID is required. This card is good only if you take 2 or more trips per day (0.58 €/trip), every day (including weekends and holidays) for 90 days. Tarjeta T-Dia. 8,60 Euros Unlimited trips until end the transport service at night. Unipersonal. ID is required. This card is good only if you take 4, 5, 6, 7 or more trips per day, price trip is 1,90€, 1,52€, 1,27€, 1,08€ or less, respectively. If you take more than 7 trips in only one day this card is the better option... but if you take 7 or more trips in 2, 3, 4 or 5 days, the best option is cards named "Hola BCN! X days". Use our ticket calculator for know what is your best choice. Buy online this T-Dia ticket (and others) with 10% off. Tarjeta T-4. 4,00 Euros Only for Barcelona residents, valid for age 65 or more. 0,40 €/trip. For more info clic here. Tarjeta T-16. 35 euros Unlimited rides for children from 4 to 15 years (only for Barcelona residents, valid till age 16). For one person only. ID is required. Costs 35 € to be paid the first time and is there after free of charge. To obtain it, go to the website www.t-16.cat, but be prepared for lots of red tape. IMPORTANT: If you want to find out what is the most appropriate and economical ticket, use our "Ticket Calculator" to find according to your needs, which is the ticket to get the cheapest price per trip. Unip. = Unipersonal. The card is only for one person (and with you ID Card or passport). Multip. = Multipersonal. The same card can be used by one or more people. Tarjeta T-Dia (T-Day ticket). Unlimited travel with any means of public transportation for 1 day (duration is not 24 hours, lasts until the shuttle service ends at night). For one person only (for example, 3 people must buy 3 tickets). Price € 8,60. If you make 4, 5, 6 or 7 trips, the price per trip is € 1.90, € 1.52, € 1.27 and € 1.08 respectively. If you do 7 or more trips in a day, this card is ideal because you can move throughout Barcelona transport taking you want. Otherwise, this ticket is a scam (this ticket and the all "Hola BCN!" too). Tarjeta "Hola BCN! 2 días" ("two days" card): Like the T-Day but for two days (48 hours from the first validation) and with unlimited travel with practically all the transports of the Zone 1 (more info at the end of this page): metro and bus of TMB, the Funicular of Montjuïc, the urban lines of FGC and the lines of train of Rodalies and the two networks of tram (the Trambaix and the Trambesòs). 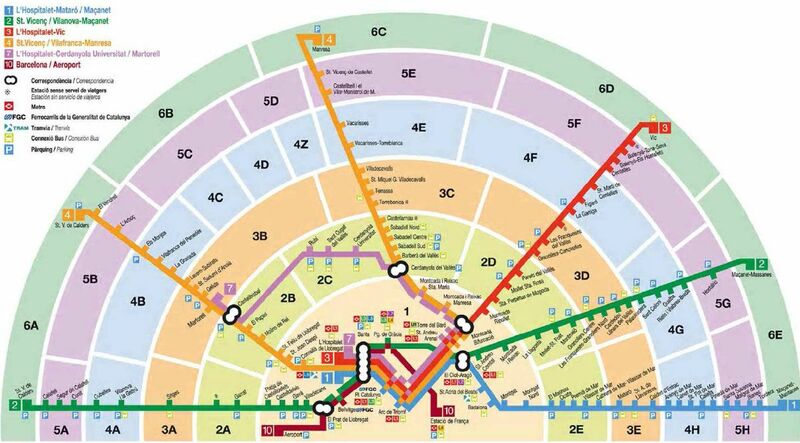 They also include the round trip by metro from the airport (T1 and T2) to the center of Barcelona. Costs € 15.00 (€ 7.50 per day). (Tip: If you buy any cards "Hello BCN!" on its official website on-line, cost 10% less). Tarjeta"Hola BCN! 3 días" ("three days" card): same as above but for 3 days (72 hours) and costs € 22.00 (€ 7.33 per day). Tarjeta"Hola BCN! 4 días" ("four days" card): for 4 days (96 hours) and costs € 28.50 (€ 7.13 per day). Tarjeta"Hola BCN! 5 días" ("five days" card): for 5 days (120 hours) and costs € 35.00 (€ 7.00 per day). Billete Bus turístico 1 día (Tourist bus ticket for one day, Barcelona Hop-On Hop-Off Bus): costs € 30.00, and € 16.00 for children 4 to 12 years, € 25.00 for seniors. (Tip: if you buy it in his webpage is cheaper, € 26.10 adult, or € 22.50 seniors). Billete Bus turístico 2 días (Tourist bus ticket for two days, Barcelona Hop-On Hop-Off Bus): it costs € 40.00, and € 21.00 for children 4-12 years, € 35.00 for seniors. (Tip: if you buy it in his webpage is cheaper, adults € 26.00 and seniors € 31.50). Billete "Teleférico ida" (Cable car Ticket): costs € 8.40 (adult) or € 6.60 (ages 4-12). Billete "Teleférico ida y vuelta" (Roundtrip Cable Car ticket): costs € 12.70 (adult), or € 9.20 (ages 4-12). Billete "Tramvia blau" (Blue tram ticket): costs € 5.50 (one way) . All places in Barcelona City are Zone 1, if you wish to travel outside the city of Barcelona (for example, the cities of Manresa, Terrassa, etc.) the price of transport tickets are more expensive depending on the area you are traveling to. A "zone 1 ticket" allows you to travel inside a single zone. A "zone 2 ticket" allows you to travel through two zones (for example from zone 5 to zone 6, or from 1 to 2). A "zone 3 ticket" allows you to travel through 3 zones (eg from zone 2 to zone 4, or from zone 1 to zone 3, or from 6 to 4, ...). A "zone 4 ticket" allows you to travel through 4 zones. A "zone 5 ticket" allows you to travel through 5 zones. A "zone 6 ticket" allows you to travel through 6 zones. You can download the map of areas of Barcelona in PDF (178 KB). Cable car (Funicular of Montjuïc) in Parallel stop, line 2, the color purple line. There may be complications, however (see at the bottom of this page under "Important" for exceptions). For example if you go round trip on a bus using the same line, it is marked as two trips, although the card ay still be within the time limit. If you take the metro, then the Tram and then the bus it's marked as only one trip. ¿Children trip is free? Yes, from 0 to 3 years old is free. From 4 years old must pay normal ticket. And what kind of transportation CAN'T I use, with the tickets? The blue tram (the tram that takes you to up the mountain of Tibidabo). The cable car from Montjuic to marine port. These tickets must be paid separately (see paragraph prices there before entitled: "Special tickets for tourists"). And how long can I use the ticket? You can use different means of public transportation for 1 hour and 15 minutes, if your ticket is for 1 zone. If your ticket is for 2 zones: 1 hour and 30 minutes. For each additional zone, you get 15 extra minutes, such that the duration of a 6 zone ticket is 2 hours. Should I check my ticket? Yes, always. Upon entering the bus or tram you must insert your ticket in the machine at the entrance to the car or the Metro or railway station FCG. You must insert the ticket into the slot, because it uses a magnetic stripe, not RF chips. You should also be mark your ticket when switching from one form of transportation to another (the machine will beep but new trip will not be marked). If you enter the subway or railway station (FCG), machines are at the entrance of the compound or on the platform. If you do not mark your ticket and are detected by ticket checkers, you may face a fine of 100 € (50 € if you pay on the spot). Ticket checkers are usually in Sagrada Familia metro station and in Sants railway station but may be anywhere. As a rule, be sure and always check your ticket in the "checking machines" before boarding. The easiest are machines at the Metro stations that allow payment with coins, bills or credit cards. The machines have touch screen with a menu of options, are in eight different languages and are very easy to use. In tobacco shops and news shops, you can buy only single tickets and T-10 tickets (10 trips). On the bus (not recommended) you can buy single tickets only (2,20 €) that do not allow transfer to other means of transportation. Aside from the fact that single tickets are the most expensive per trip, the bus drivers can rarely make change, and may not allow you up to the bus if you don’t have exact change . If you buy the ticket on the bus, remember that you enter from the front of the bus and pay the driver when entering (or check your ticket in the machine if you already have a ticket). This may seem obvious but it isn’t to everyone (in Japan for example, you enter through the back of the bus, the driver is paid at the end of the trip, and you exit through the front door of the bus). Be very careful of pickpockets in Barcelona (especially if you look asian like japanese or chinese). We have an excellent police force in Barcelona an but they (and we all) are at the mercy of politicians who do not seem to be interested in stiffening laws to punish pickpockets. So when the police arrest a thief, he/she is freed within 30 minutes to continue stealing. Barcelona is the paradise for thieves! Pickpockets steal mainly on the escalator, when the tourists leave or enter the subway car, and sometimes on the street (especially in Las Ramblas). The vast majority of pickpockets are Moroccans or Romanian Gypsies, but not exclusively, There are a few Spanish pickpockets, as well as those from other countries. You only feel a a bump when steal from you, they are like (bad) magicians, but don't normally use violence. Watch your wallet, cell phone and luggage well, and you should be ok.
One last thing: Metro tickets (T-10, T-Mes, etc. EXCEPT single ticket) can also used for the bus, Funicular of Montjuïc, and rail of FGC, without buying a new ticket-provided it is within the time limit (usually 1 hour 30 minutes) and if you don't exit the compound (be aware: if you buy the single ticket, on the bus, for example, you can't use it in the other transports). Here’s example of travelling on various means of public transportation with the same ticket: if you enter in the metro, your ticket will be marked with one trip. If you then re-enter, the machine will mark another trip (2 trips total). On the other hand, if you enter in the metro, travel to another station, leave the metro and take a bus, you can use the same ticket without the machine marking a new trip. You can use various means of transportation using the same ticket, if don't exceed the time limit (approximately 1 ½ hours, depending the type of ticket you use). Should you discover any fault or defect in this website, contact us and we’ll fix it. Thankyou very much for your visit. We hope that our explanation of metro ticket prices was helpful to you.